The accommodated tour from Cape Town to Nairobi is basically the same as the camping tour, with the big difference being that clients will overnight in comfortable rooms instead of camping in a tent. This tour covers all the highlights of the 20 day Cape Town to Vic Falls tour + all the highlights of the 21 day East African Adventure. 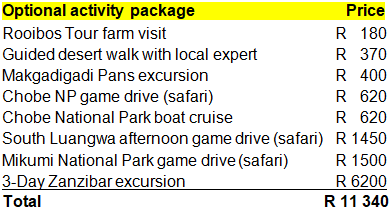 This overland tour also combines some of the diverse cultures of Africa with spectacular natural landscapes. You will even meet the Bushmen and Masai Tribes. 1. Accommodated (hotels/ lodges): Clients overnight in a comfortable twin rooms or permanent safari tents, mostly with en-suite bathrooms. As described below. This epic 41 day adventure tour from Cape Town in South Africa to Nairobi in Kenya starts as we make our first stop at Table View for some photos of the world famous Table Mountain from across Table Bay. Once we are done, we travel north to the Cederberg region. It not only boasts spectacular mountains and orange farms, but it is also the home of the Rooibos bush and today we will visit a working Rooibos tea farm and see the plants of Rooibos and Buchu that occur naturally in the wild. Indigenous to the mountain slopes of the Cederberg, this herbal beverage has earned an international reputation as a healthy and refreshing alternative to regular tea. A dinner at our overnight stop offers an opportunity for us to get acquainted while enjoying some South African hospitality. Leaving Swakopmund early, we make our way to the massive granite formations of Spitzkoppe which tower 700 metres above the desert plains below. The presence of rock art indicates their significance to the San people who lived here many years ago. We will enjoy a walk with a local guide and have the opportunity to view some examples of the San’s rock art before setting off for our overnight stop for the evening. From Etosha we turn south and travel down to Windhoek. Windhoek is the capital city of Namibia. Upon arrival in Windhoek, we will take a short walk through the city centre and have the opportunity to view some its better known landmarks. Our overnight stay this night is situated halfway between the city and the airport. 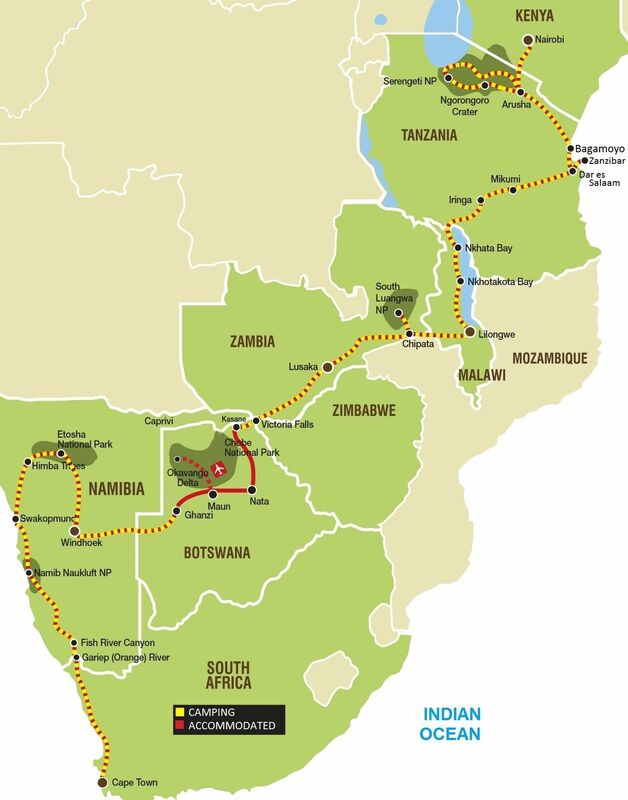 Today we turn east and travel neighbouring Botswana and the Kalahari Desert. Starkly different to the Namib Desert after which Namibia is named, the Kalahari is no less dramatic and covers over 900 000 square kilometres. The San people have long been associated with this harsh environment and tonight we enjoy a dance evening that provides an insight into their culture of song, dance and story-telling. Today we board our overland truck and set off for Malawi, the warm heart of Africa. Our destination tonight is the shores of Lake Malawi, the southernmost lake in the East African Rift system. As one of the ten largest lakes in the world, the lake stretches for over 500km along the western boundary of Malawi and is home to more species of fish than any other lake. We spend the night on the shores of this natural wonder. We are back on the road for most of the day travelling further north and will overnight once again on the banks of Lake Malawi. Enjoy the sunset over the lake from the beach. Your guide will assist you to plan your activities for the coming days, or you can simply slow your clock to Africa time relaxing on the lake shore.